Minions are excellent assistants who will be added to your game. This is not the usual mobs with replaced texture, they are the real companions performing various tasks. You will be pleasantly surprised when 5 minions will do different routine tasks for you. In addition, the minions have babies, they will love you :) . New mob Gru and new sounds. You are incredibly lucky because an evil genius will be your friend. Yes, maybe he was not very good and did various dirty tricks but now he has changed and is ready to come to your rescue at any moment. Gru always protects his minion friends and can rebuff the evil ones. Give him a bow and he will become your protector. New sounds when interacting with minions. New UUIDs and names of objects. Available languages: Spanish, English (US and UK). Added evil minions (purple), read the description about it below. How to tame a minion? You will have some difficulties, because the minions are found only in the nether world. You will have to visit this sinister place, or you can spawn them using spawn eggs (which simplifies the task, isn't it?). Once you have found or spawn of your future assistant, feed him a carrot (now it is a banana). There is some chance of a successful taming (33 per cent). 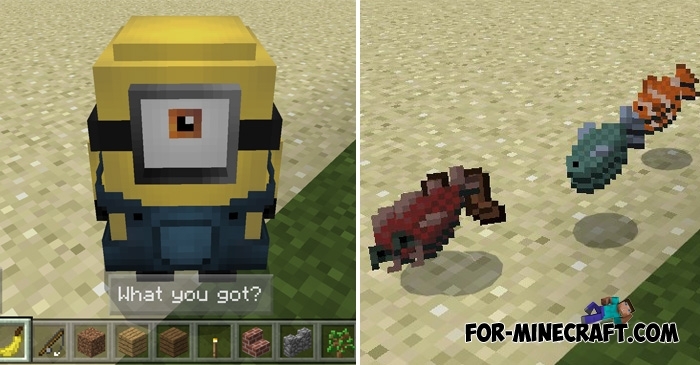 If you have successfully tamed a minion, then you can give him different tasks or use commands (for example, waiting for you). How to give a job? There are 6 different jobs that can be performed by tamed creatures. For example, if you give him the ax, it will cut down trees, and later comes back to you and gives extracted resources. It is very convenient because now you do not have to spend time on the extraction of resources, minions do it for you. Hunting: give him a sword, and it will start to hunt for animals. Wood extraction: give him an ax (it is desirable to be in a forest). Ore extraction: give him a pick and soon you will get different ore. Hoe: minion will prepare the ground for planting. Extraction of ground: give him a shovel and look for the process. The last feature is the fishing. Give him a fishing rod, and soon you will get food. You just need to wait for about a few minutes after you give a job to your minion. Then the minion will return and give everything that is extracted. How to get bananas for taming? You will see real bananas instead of carrots. Grow bananas in the fields as before and use it to tame. How to spawn the evil minions? Evil minion weaker than tamed one and will attack all living creatures except hostile mobs. Additionally it can turn into a good or wild minion using various potions. Just throw a poisonous potion in it and it becomes an evil purple minions (a few seconds). Remember the purple minion will attack you until it dies or will not be tamed. 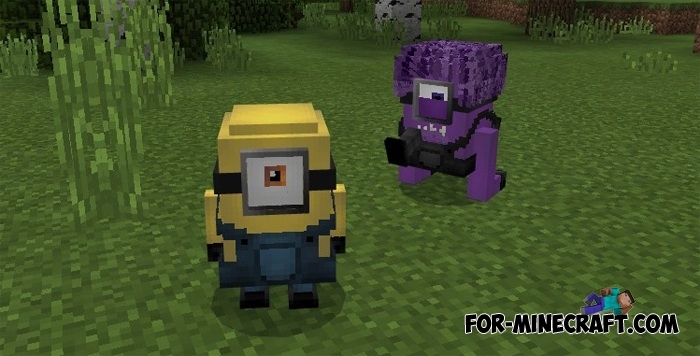 Also, purple minions will attack yellow ones and turns them into similar to themselves. Therefore, protect the good minion and always keep the potion f weaknesses in the inventory. Evil minions spawn everywhere in the ordinary world, and can turn into tamed and wild minions. Perhaps in the next update, minions will have their own voice and action sounds. How to install the Minions mod? Start the game and activate the downloaded files in the world settings.